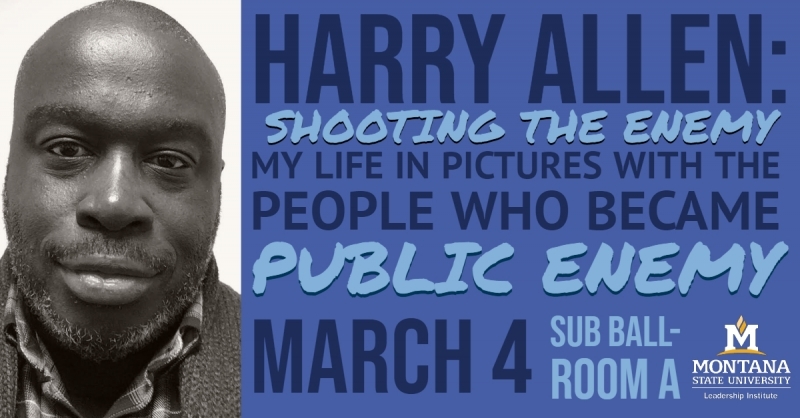 A pioneering photojournalist of the early hip hop movement, Harry Allen, will speak at the Montana State University Strand Union Building Ballroom A on March 4. Doors open at 6:30 p.m., with the lecture beginning at 7:00 p.m. Allen, a hip hop activist and cultural expert, captured candid images of the influential hip hop group Public Enemy before they became famous for their highly political music and their fight for African-American rights. Presented by the Montana State University Leadership Institute, Allen’s photographically enhanced lecture, Shooting The Enemy: My Life in Pictures with the People Who Became Public Enemy will present documentation of hip hop’s rise and the early stages of supergroup, Public Enemy. He will screen many of his photographs from the early 1980s, including rap performers Chuck D, Flavor-Flav, Bomb Squad leader Hank Shocklee, Keith Shocklee, and others. “While ostensibly about these images, the discussion ultimately reflects on how one can navigate opportunity even when unsure of its outcome,” said Allen. “As student, it is exciting to see that Mr. Allen, someone who has played an integral role in the promotion of early hip hop culture, will be speaking at MSU,” says Ben Manion, a Film Student and Student Associate of the MSU Leadership Institute. “His focus on navigating opportunity early in life resonates strongly with me as a college student and I believe he will bring a valuable perspective to our campus,” added Manion. Allen’s work has been featured in The New York Times, Billboard, Harvard Design Magazine, Mojo, and other print media as well as in the permanent collection of the Smithsonian Institution’s National Museum of African American History and Culture. Shooting The Enemy has been presented to Harvard University, Stanford University, Cornell University, and many other universities across the country. Allen now serves as an advisor to the Archives of African American Music and Culture at Indiana University. From 2003-15, Allen was also the host and producer of the weekly WBAI-NY radio show, NONFICTION. Free tickets are available now at https://tinyurl.com/HarryAllenMSU and in limited supply when doors open for the lecture at 6:30 PM. Harry Allen’s photographic lecture is sponsored by the College of Education, Health and Human Development, Jake Jabs College of Business and Entrepreneurship, College of Letters and Science, College of Arts and Architecture, School of Film and Photography, School of Music, Department of Liberal Studies, Department of English, KGLT, Office of the Provost, and the Associated Students of Montana State University.